Harvard has reduced its greenhouse gas (GHG) emissions by 30 percent during the past decade, the Office for Sustainability announced in early December. The goal, adopted in 2008 and measured from a 2006 baseline, was met despite 15 percent growth in square footage and an increase in energy intensity of existing space. (New laboratories, which use 46 percent of the energy on campus but represent just 22 percent of the space, account for a significant portion of this intensification.) The University achieved its goal by reducing demand (net energy use declined 10 percent during the decade); by shifting to renewable energy sources; and by “decarbonizing”—seizing the opportunity to make more use of low-priced natural gas, a less carbon-intensive fossil fuel than oil or coal (whether used to generate electricity or burned directly for heating and cooling). Ninety-seven percent of the University’s emissions are attributable to energy use in buildings, the sustainability office reported (see page 21 for a portrait of its director ). Thus, nearly a quarter of the reduction in GHG emissions came from reduced demand, achieved largely through more efficient lighting, heating, and cooling of buildings; a further 19 percent of the reductions reflects the purchase of renewable energy—principally wind power from Maine and shares of hydroelectric power from existing generators in Massachusetts. Another 8 percent was due to improved tracking and management of potent, short-lived pollutants called refrigerants. But the largest gains are attributable to switching fuels, from oil and coal to natural gas, which fell in price during the decade as new domestic supplies became available. This was true both for the regional supply grid from which Harvard buys electricity (16 percent of the total emissions reduction reflects these suppliers’ less-carbon-intensive fuels) and for Harvard’s own district energy supply (representing 33 percent of the emissions reduction, a portion of which is attributable to the switch to natural gas). A major factor was converting a University steam plant to natural gas. 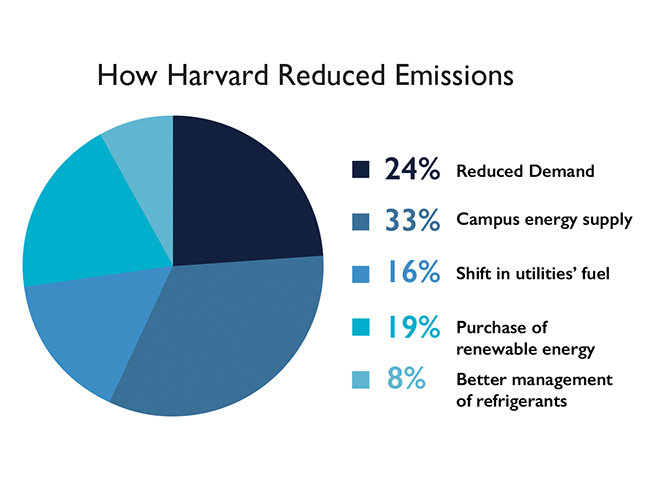 Other upgrades to Harvard-run utilities, including an expanded, combined heat-and-power system, energy-efficient boilers, and improvements to the efficiency of chilled-water plants further reduced the emissions impact of Harvard’s utilities.